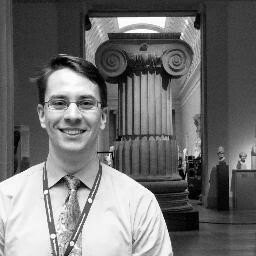 My second interview in the Schools and Museums series is with David Bowles, currently Assistant Museum Educator for School Programs at the Metropolitan Museum of Art in New York City. Although the Met is much larger and has many more visitors than most other museums, I think David’s ideas are both smart and broadly useful. Before working at the Met, David worked at the Rubin Museum of Art. David also participated in The Think Tank for a year-long exploration of school visits to museums that I hosted while at The Noguchi Museum. Why should museums offer school tours? On a basic level, museums are for everyone, so a museum needs to serve everyone. We work with school groups because we work with all human beings. In the United States, museums and museum learning are caught up in the progressive education movement. John Cotton Dana, said, “Study your tea-cups.” He meant that you should be aware of the world around you, you should understand where your things come from. Lucy Sprague Mitchell, who started the Bureau of Educational Experiences – which became Bank Street College – was interested in helping young kids understand where their food comes from, how the buildings around them got built. Why is the world around us the way it is and how could it be different? A functioning democracy requires that people know how to ask questions about the past. It makes sense for museums to work with schools, to help students become active participants in the world – where their food comes from, why their schools look the way they do, what lasts, and why. What are the costs of school tours to a museum, in time as well as money? Here at the Met it’s phenomenally complicated. We are fortunate to have an endowment which allows us to offer free admission and guided tours to all New York City schools. In 2013, the Met had over 53,000 visitors who came as part of guided school tours (this includes teachers and chaperones). We have about 125 volunteer and 27 paid educators. There are about five positions in the Education and Visitor Services departments dedicated to school tours. And of course, staff from other departments – IT, Design, Editorial, Volunteer Services, Security, and Custodial – who end up with work related to school tours. And then of course teachers still need to book buses and negotiate with administrators. What do you see as some of the inefficiencies of museum school tour programs? The logistics are very complicated. At the moment, at the Met, our staff resources are not yet in alignment with the way we invite schools to book tour offerings. Long story short, this means that some volunteers feel underutilized, while others feel overwhelmed. The same can be said for paid educators as well. We are working to align these systems, but there are a lot of moving parts. More generally, there is a fundamental disconnect between what teachers need and what museums are willing to offer. For example, school groups need a place to eat lunch. We don’t have that space… yet. So much effort and energy on the part of teachers could be alleviated if museums would offer a space for students to sit and eat. Another inefficiency is trying to align the tours with curriculum. Sometimes teachers book a tour to support a specific moment in the curriculum, but then life gets in the way and the kids aren’t actually studying this topic by the time the tour comes around. It makes me think about the value of tour topics that are rooted in content areas (like Art of Ancient Egypt) vs. tour topics that are thematic (like Communities Around the World). I have been thinking a lot about how much we should adapt programs for teacher requests. One teacher requested a Canterbury Tales tour. A Met educator spent a phenomenal amount planning this tour, and then the teacher cancelled. This brings up questions of adaptation vs. customization. What are the boundaries of each? 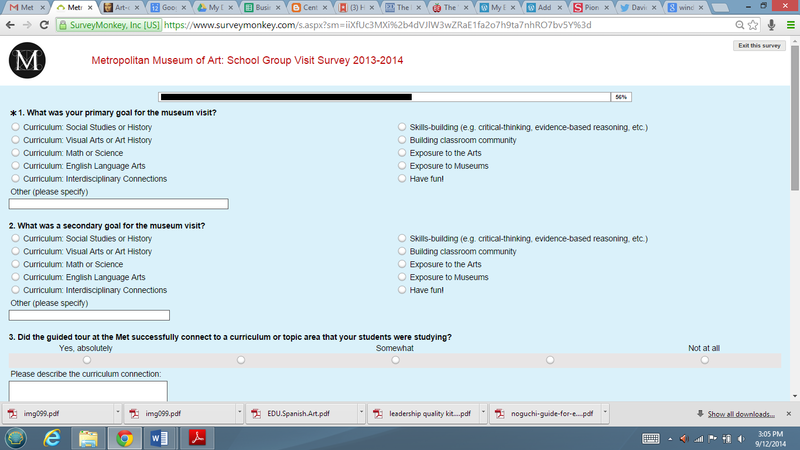 And to what extent are museums willing to plan tours according to the goals of teachers and students? Ben Garcia’s article “What We Do Best” (Journal of Museum Education, Summer 2012) suggested that we are selling out our collections when we do this. Ben brings up good points about being true to ourselves and playing to our strengths. But just as museums cannot customize tours for each group, they also cannot be only interested in themselves and what they do best. We have to meet at a middle ground (in the same way that we must adapt our teaching for other groups). We have to make an effort to understand why people want to use museums, and incorporate that into our plans while pushing things forward a bit by asking ourselves questions like, “What don’t they yet know that they can do in museums?” Although this begs the question: can we really meet needs related to the school curriculum? You and I worked together in The Noguchi Museum’s “Think Tank” a few years ago. While many of the classroom teachers in this group said at first that they don’t need a curriculum link for their visits (although they do need something to justify the trip to their administrators), they seemed to change their minds when actually planning museum trips. The trips need to make sense in their own school contexts. Anecdotally, teachers often mention fun as a Met tour goal in conversation. So I wonder how mutable this data is. The context in which you collect information matters. An online survey feels official, so I am probably getting official responses. If I asked over wine and cheese, the answers might be different. What would school tours look like in an ideal world? 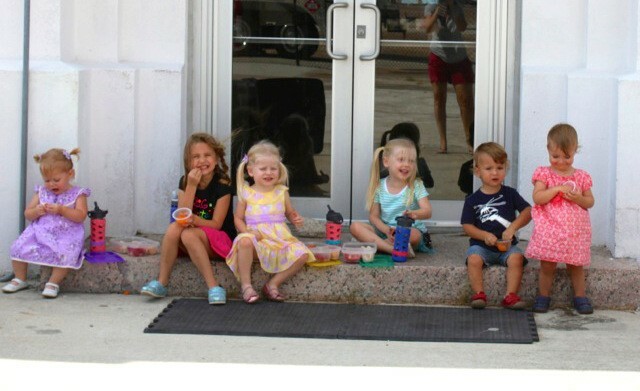 There would be free limitless space for schools to sit and eat lunch. School groups are often traveling an hour to get to museum – we should value their comfort. There would always be something to do besides group discussions – there would be activities. There should be choice embedded in the structure of the experience; students should be able to make informed decisions about what they want to do during some aspect of their visit. Museums would have open maker-spaces, where kids could respond to their visit in a way that is not a directed art-making activity. Museums would integrate evaluation throughout the tour experience. In the planning stage, we would have time to reflect – how do you want this program to work? Right now we do so much work to create reports that just get filed. We would do much better to gather solid data about how what we are doing relates to our goals. Visits would be more integrated into what is happening in the classroom – instead of one-off visits, we would see a more holistic approach. Well-resourced schools sometimes do this. At the Rubin Museum of Art, we were able to form relationships with some of the teachers and really build visits into their curriculum. Clearly there is a tension here between wanting to offer customized visits that are part of larger relationships, and arguing that for efficiency’s sake we should not customize school tours. If you had to choose between serving fewer students in a more meaningful way, or serving many students with non-customized tours, which would you choose, and why? Other thoughts on this? Honestly, I’m not ducking the question by saying this, but why must this be an either/or proposition? We can do both. In fact, we are starting to do that now. The Met will be partnering with a few schools in the city to develop a sort of holistic package approach to partnership – in-school programs, in-museum programs, after-school programs, PD for teachers, Family programs, etc. This will be in addition to the broad tours that we’ve been discussing. Lots of challenges of course, but lots of opportunities. Stay tuned. You mentioned space for lunch. Imagine that museums had this space. How might that change the quality of a school visit? So many reasons. If there is space for them to have lunch, groups can slow down. Tours could become a two-hour experience. They could make a day of it. Settle in. Lunch spaces might improve student focus – hungry children are unfocused children. Lunch could also punctuate the day – there is something to be said for doing something, taking a break, and then returning to it. It would also send an important message about the museum’s priorities; that young people and their needs are valued. When I was at the Rubin, there was a first-grade teacher who brought her students to the Museum as part of a unit on “How Cities Work.” She wanted kids to understand museums, and how they work, as part of cities. So she arranged to have the kids interview people who work in museums – security guards, people who work at the front desk or in the gift shop. The students led the tour. First graders. She was an amazing teacher, who really made the museum visit work. September 29, 2014 in Exploration: Schools and Museums. Thanks for sharing your perspective David! You made a lot of thoughtful points that resonated with me as a Museum School Programs Manager including valuing school needs(i.e. space for lunch) and working within a museum’s capacity (space, staff, budget constraints). I find it interesting that something as simple as finding a place for school groups to eat on a visit can be so problematic for museums yet can offer so many benefits! This has inspired me to give some serious thought about how to find solutions. If anyone has ideas to share please add to this discussion.